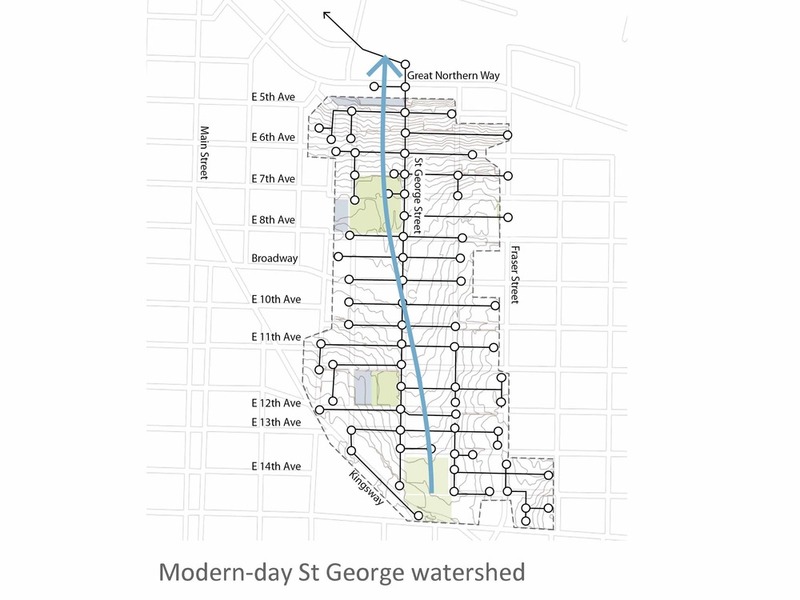 The St. George Rainway is a community led initiative aiming to recreate the historic creek that used to flow along the path of St George Street in Vancouver. The Rainway will bring the neighbourhood together, celebrate the rain, a demonstrate an ecologically-diverse way of managing rainwater in the city. The Rainway concept has now been incorporated into the official community plan for the Mt. Pleasant neighbourhood. This year's BCSLA conference -- "Shifting Currents: Rethinking our Relationships with Water" -- explored the theme of water from many different perspectives. We were thrilled to be invited to present on the St George Rainway Project, and to lead a walking tour of St George Street. Can we think like nature and see rainwater as a resource? The St. George Rainway group is interested in expanding our relationship with water - we are a community-driven initiative that seeks to recall a historic waterway in Mount Pleasant. 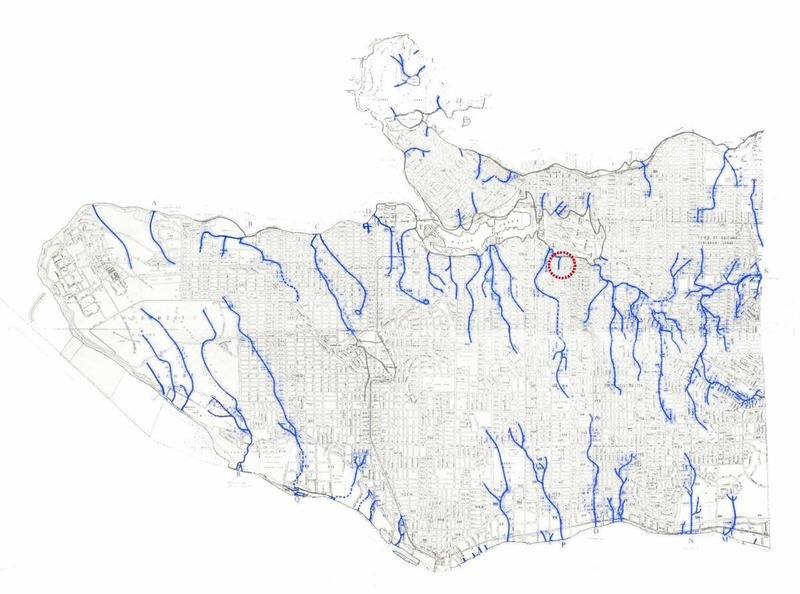 The goal is to use rainwater runoff from the streets, lanes and adjacent properties to recreate this lost stream in the form of a “rainway” along St George Street - the Rainway is also known as “te Statlew” which means little creek in the Musqueam language hən̓q̓əmin̓əm̓. Gladys grew up in Mount Pleasant and spoke fondly in her writings about playing in the ravines and creeks that used to be here. 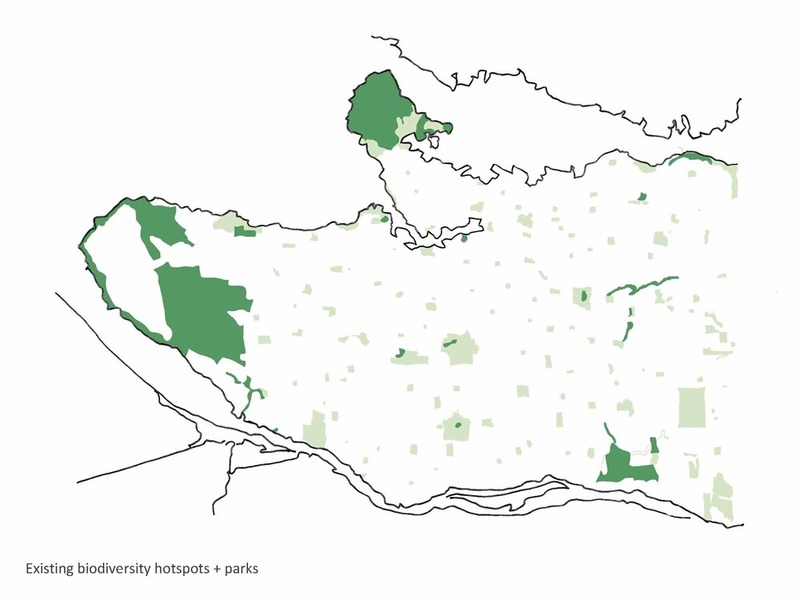 Mount Pleasant’s creeks, as well as the majority of Vancouver’s creeks, were gradually lost over the first part of our city’s history. Prior to development there were over 50 fish-bearing streams across the city, and an abundance of salmon, birds, and other types of wildlife they supported. The little creek circled in red is what we now refer to as St George Creek or te Statlew. 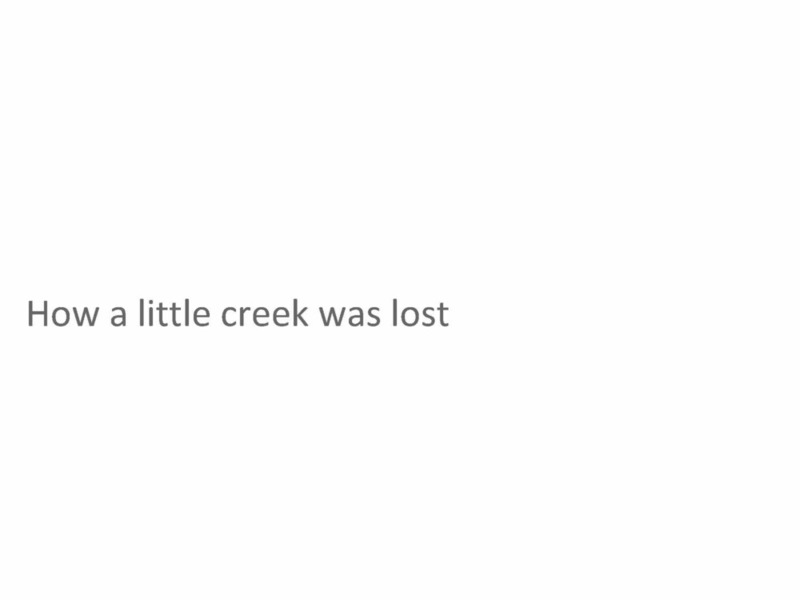 What happened to all of these creeks? In the city’s early history, well before a central sewer system, residences relied on outhouses and septic systems for wastewater disposal. This worked ok while development was sparse and flows were low, but once houses were connected to the City water supply this quickly led to more wastewater than their systems could handle. Overflowing systems would commonly run into the streets and lanes, and eventually creeks, which led them to be considered public health hazards. In 1911 this prompted the City to initiate what’s known as the R.S. 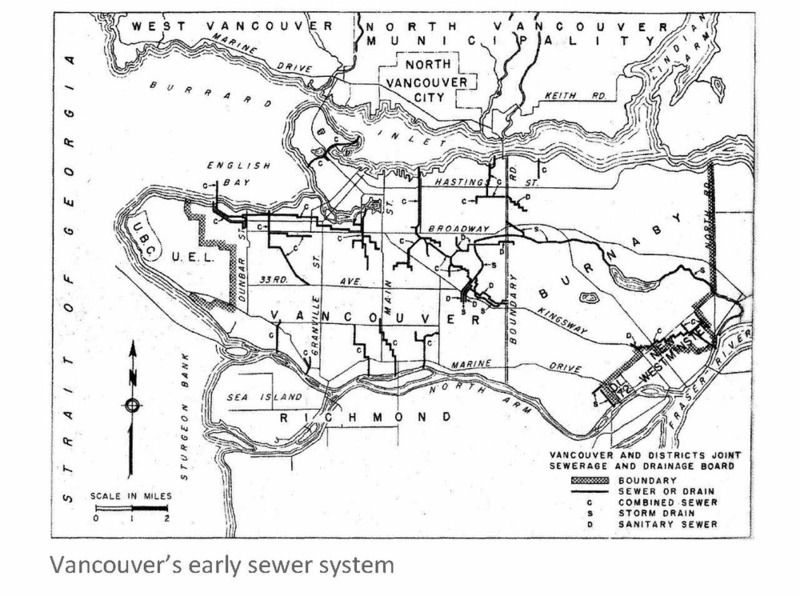 Lea plan for creating a network of sewer pipes to transport household sewage away from residences and directly into False Creek, the Burrard Inlet, English Bay, and the Fraser River. This map shows the inferred location of the creek based on modern contour lines, and it shows how, over time, the creek’s watershed has now been converted to a network of storm sewer pipes. The original vision for a daylighted creek along St George Street was articulated by local designer, Bryn Davidson, who explored the idea as an architecture student at UBC. Later, his proposal was recognized in the City Planning Commission’s 2005 ideas competition called “21 Places for the 21st Century”. 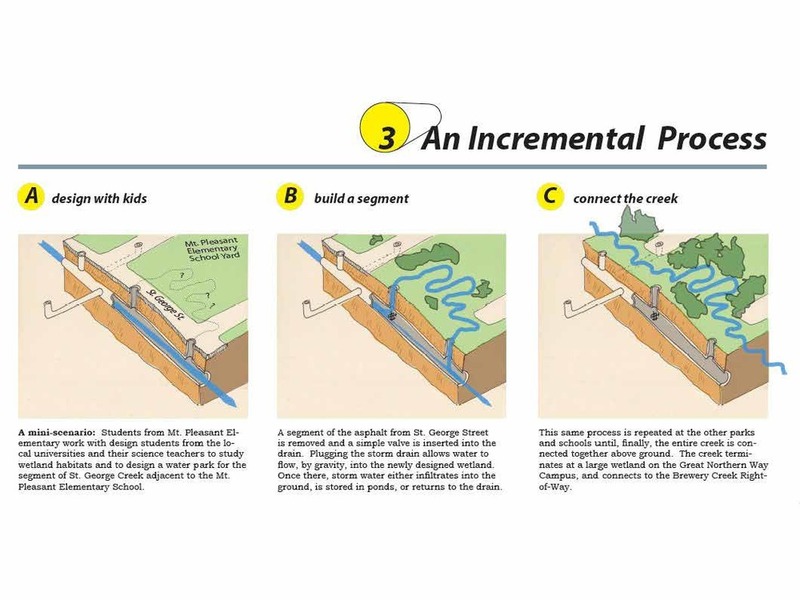 His vision, and that of the St George Rainway Project, is to capture rainwater from the new, urbanized watershed, and convey it through a constructed waterway within the street right-of-way, diverting surface stormwater from the sewer system. "I live by a small stream"
In 2009, educator and poet Rita Wong was working & researching the poetics of water and came across Bryn’s project. The following year, Rita and her neighbour Shahira Sakiyama organized an event that spurred efforts to recreate the creek. And so the St. George Rainway project was born…. The initial community gathering to discuss Bryn’s proposal was on a rainy Sunday in 2010, at the Native Education College. Bryn spoke along with local historian Bruce Macdonald. 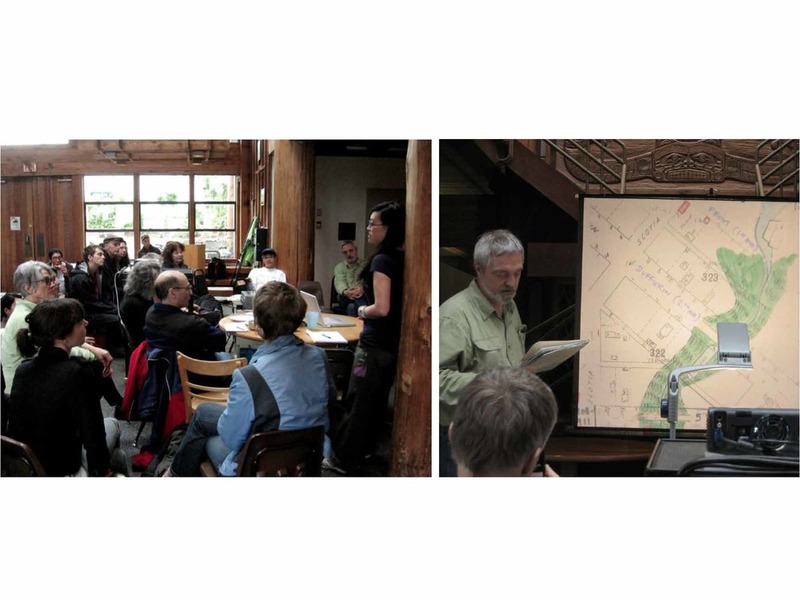 Many community members were present, including representatives from the False Creek Watershed Society. After this initial conversation, which was so enthusiastically received, a working group was created, affiliated with the False Creek Watershed Society. The name of this working group became the St. George Rainway Project - and now, simply “the Rainway, te Statlew” in respect for the first peoples’ language of this land. As you can see, St George Street, like many in the city, consists of two traffic lanes and two parking lanes. 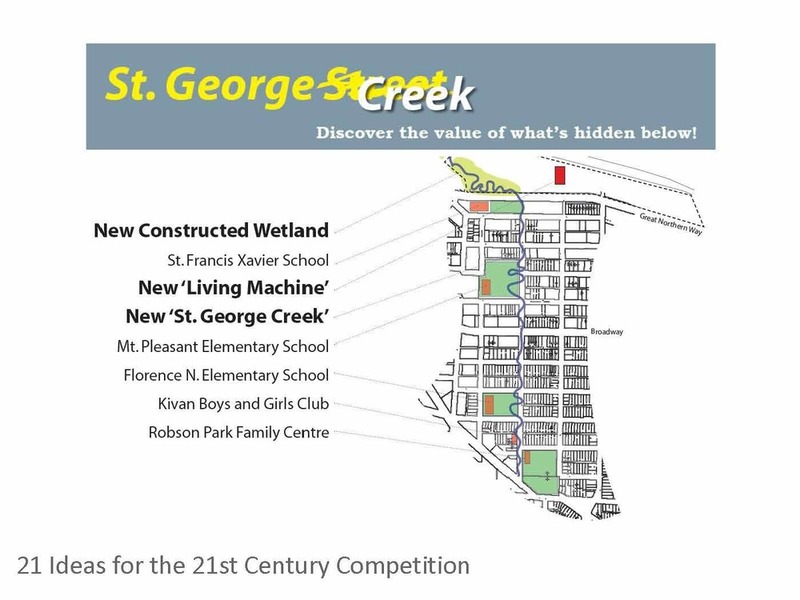 The daylighting proposal is for one or two lanes of St. George street to be allocated for the re-creation of the creek with surrounding green space. Its interesting to note that much of St. George Street has gravel parking lanes and no curbs & gutters at the edges of the street, these ‘unfinished’ edges naturally create mini creeks during rainfall. As our group explored what daylighting involved, we began to realize that full daylighting, which implied accessing and uncovering the original stream, was unrealistic given the constraints of a city street. The rainway concept could be considered as a new channel of water, where the historic stream is recreated on the surface. 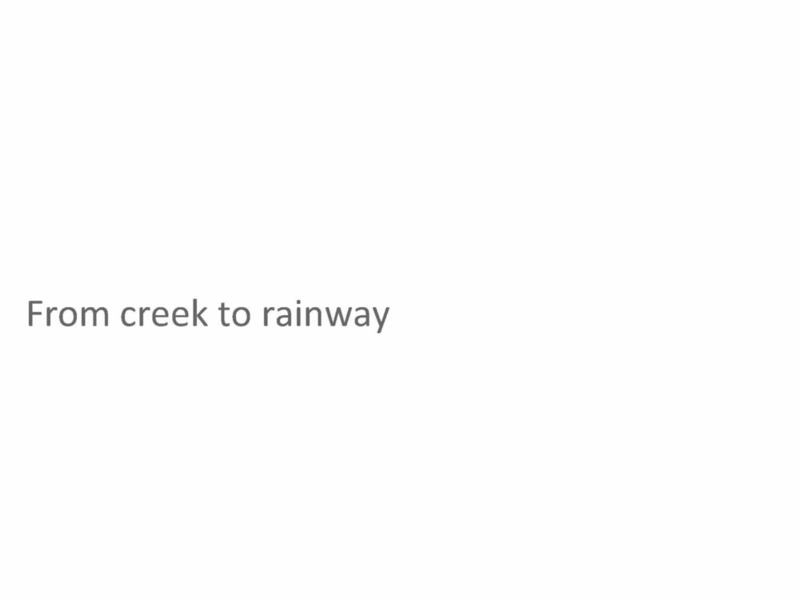 The idea of the rainway is to work in parallel with the underground stormwater system; when rainfall is light to moderate, the creek flows along the new streambed at the surface level. When rainfall is heavy, the extra water flows into the underground stormwater pipes. Another excellent set of precedents can be found in Zurich, a city where the majority (80%) of the sewer system is still combined, much like Vancouver. Since the 1980s Zurich has constructed 18km of new stream channels, with the intent of supporting native wildlife, increasing people’s access to nature, and reducing the volume of relatively clean water going to the wastewater treatment plant. 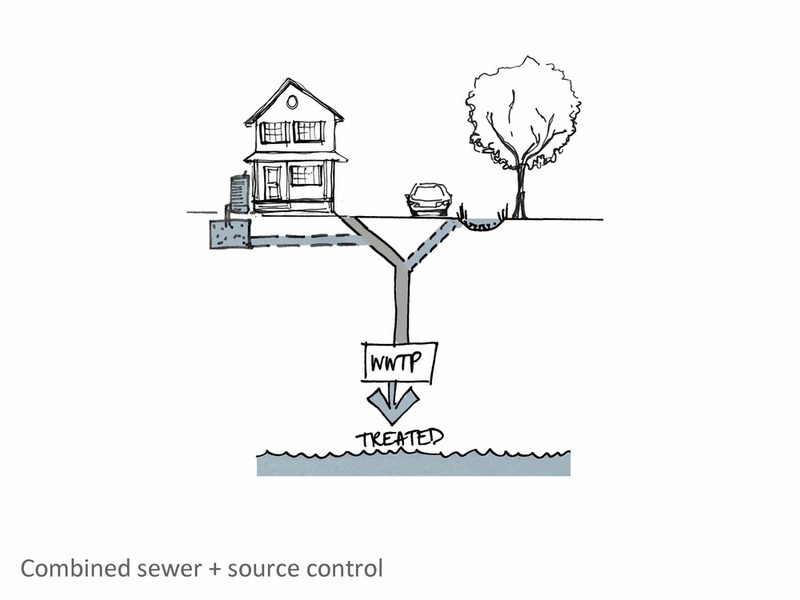 Zurich's constructed streams are designed to carry 3 to 5x the dry weather flow, with the excess going into the sewer. There are a number of pros and cons on each side of the combined vs separated sewer debate. In combined sewers wastewater and rainwater go to the wastewater treatment plant most of the time and are somewhat treated before being discharged to the ocean. When there are large rainfall events, though, there is too much volume for the pipes to handle and the excess, untreated water is discharged into the ocean. The City’s is currently seeking to twin the pipe system so that wastewater goes to the wastewater treatment plant, while rainwater gets discharged directly to receiving water bodies. While this eliminates combined sewer overflow events, it introduces a new problem: a steady stream of new contaminants now go to the ocean untreated, including hydrocarbons and heavy metals from road runoff. We would like to see the City incorporate more surface-based stormwater management techniques, such as rainways, infiltration facilities and constructed wetlands, in order to keep the excess water from entering the sewer pipe to begin with. In areas of the city that already have separated sewer systems, incorporating surface-based stormwater management tools such as rainways will also have benefits, by filtering the stormwater before it is discharged to the ocean. By managing stormwater on the surface, such as in this example from Portland, we can increase the capacity of the storm sewer system and prevent sewer overflows, while creating ecologically valuable green corridors that also increase the livability of the city and engage the Community. 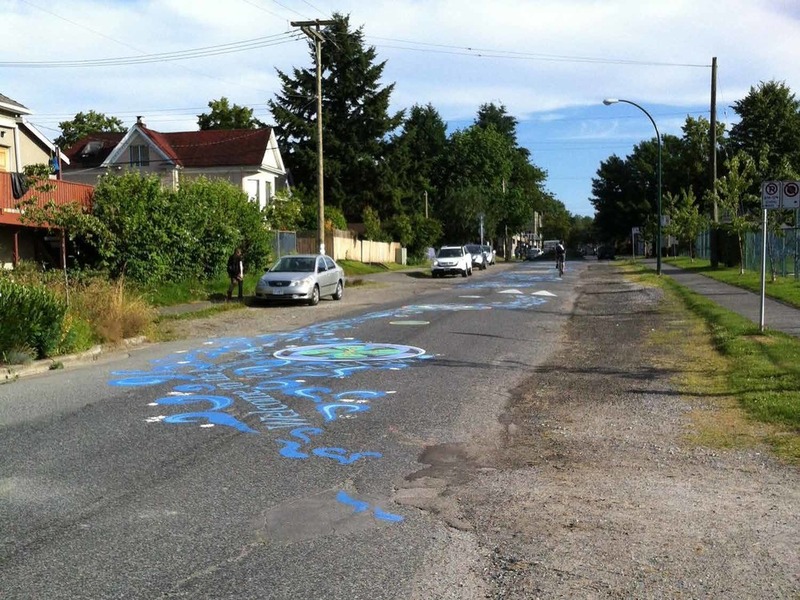 The Rainway group has engaged the neighbourhood around St. George Street in a variety of ways from hosting community walks, to liaising with nearby elementary schools, to creating a street mural, to facilitating community design workshops & surveys, and more…. 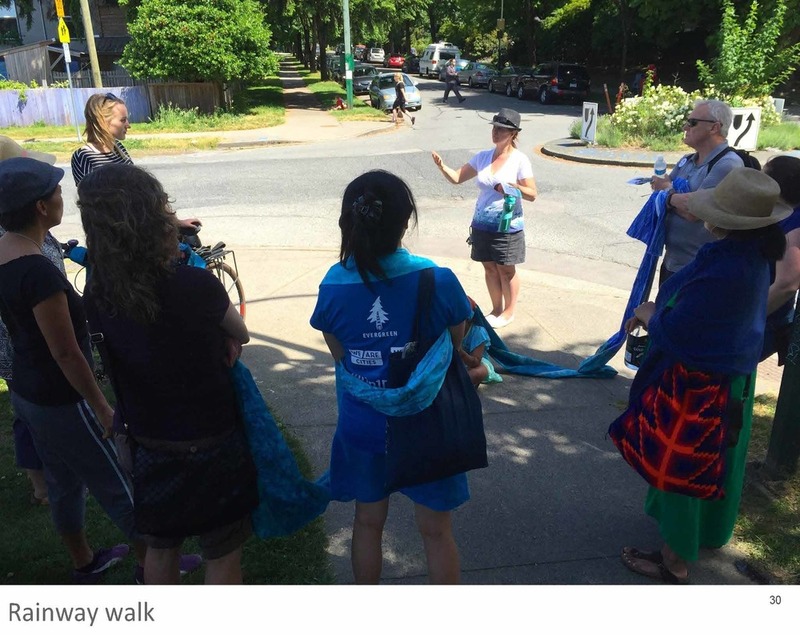 Initial walks were co-hosted with the False Creek Watershed Society as part of their Earth Walks Vancouver series in which walks recalled the path of a lost stream or creek. Other walks were part of events with the local elementary schools, such as Mt Pleasant Days, as well as in last year’s “100 in 1 Day” Vancouver event. With support from the city, we were able to hold several community design events to explore ideas of potential street redesign. The concept drawings that emerged became a helpful visual tool to talk about the Rainway at neighbourhood events such as the Autumn Shift Festival and MetamorFest. 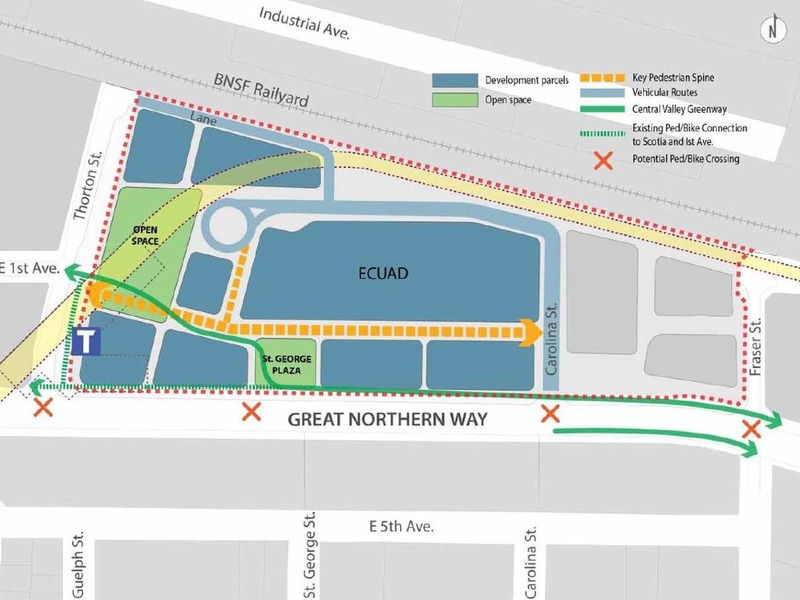 This overview plan (north is right) shows the proposed layout of the Rainway along St George Street between Kingsway and Great Northern Way. 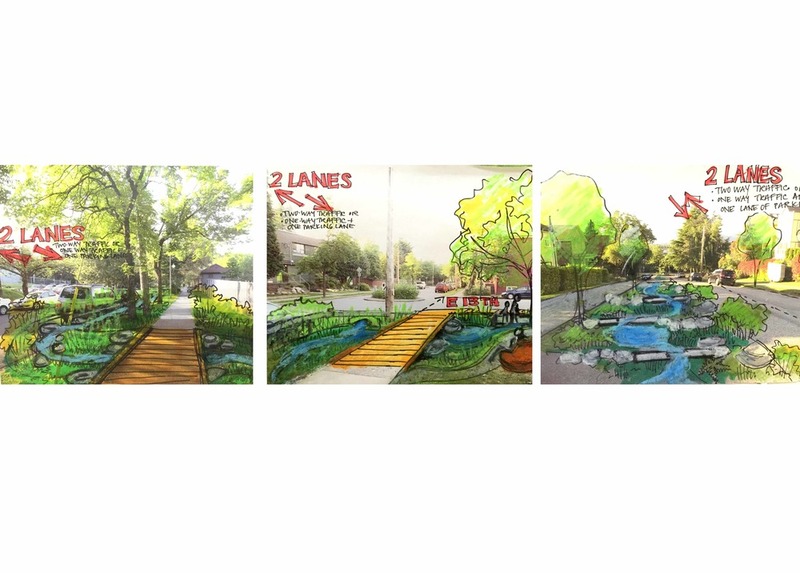 The Rainway would incorporate sections of stream, wetlands, community art projects, and learning spaces. These sketches show what the character of the Rainway could be at a few points along the way. 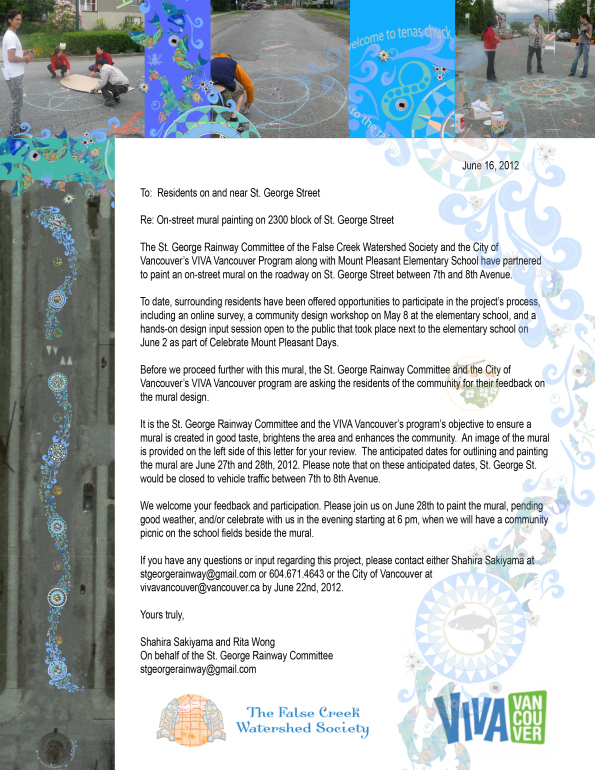 With participation by the children and other members of the community, the Rainway painted a mural along one block of St. George Street, by Mt Pleasant Elementary school in June of 2012. The mural highlights the life cycle of salmon and includes the words for water in languages spoken by neighbours. 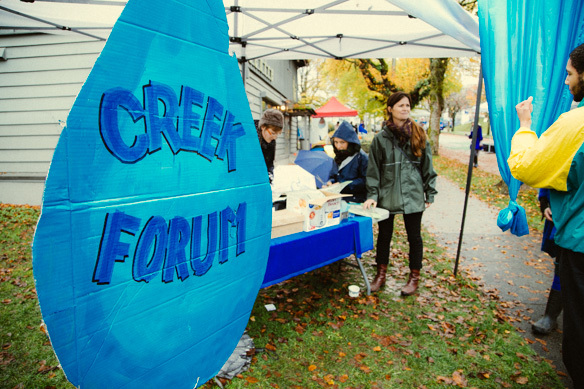 Another excellent example of the Rainway’s community engagement was the Creek Forum. Students from Mt Pleasant Elementary school participated during the year-long program. The Creek Forum was a great success – engaging students from Mt Pleasant and Florence Nightingale elementary schools as well as other community members in design, art, ecology, and storytelling activities. We were pleased to have the Rainway included in the Mt Pleasant Community Plan in 2013. The plan recognizes the Rainway as a potential public realm project that celebrates the historical creeks in the neighbourhood. We have also worked with developers along St George Street to encourage them to capture rainwater and make it visible. At the north end of the street is the Great Northern Way campus. We participated in the planning process by sharing our vision for the site and offering principles for design. More recently we've participated as stakeholders in the development of the City's Integrated Rainwater Management Plan. Overall, the feedback from the community has been overwhelmingly positive. From the neighbours' perspective one of the biggest challenges is potential changes to parking availability. There are a number of street / parking configurations that are possible to address these concerns. Another challenge with the project is the fact that it spans a lot of traditional municipal silos. By recreating ecological corridors we can improve the function of remaining natural areas, thereby increasing our health and well-being. 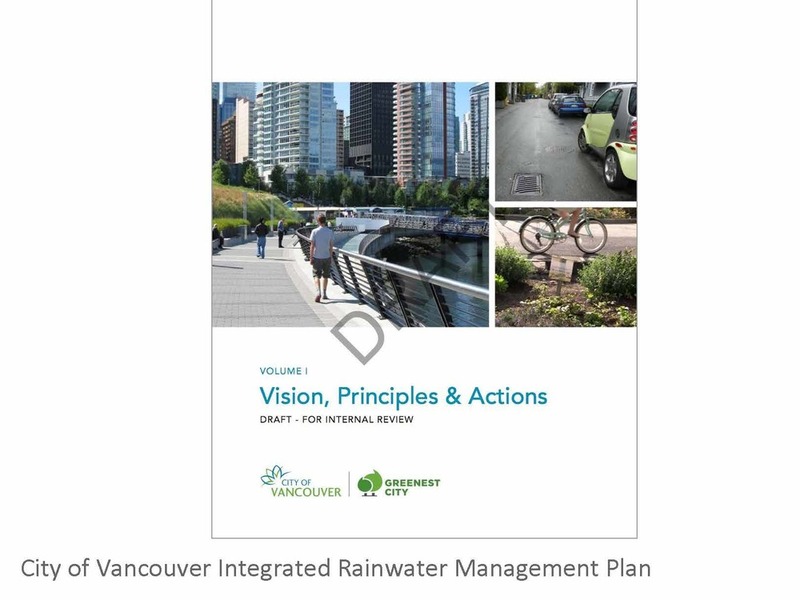 We're excited to be stakeholders in the development of the City of Vancouver's new Integrated Rainwater Management Plan. The Plan is expected to go to Council this spring. Stay tuned! We had a booth at Celebrate Mount Pleasant Day, at Mount Pleasant Elementary school, Saturday June 6 from 11am to 3pm, and led a walk along St George street, tracing the path of the future (hopefully!) rainway (te Statlew) - an event that was part of Vancouver's 100-in-1-day celebrations. We will meet at the corner of 13th Avenue and St. George St where there is a Storytellers' Bench marking the headwaters of the rainway. Following the path of former St George Creek, we will share stories of what the stream mean to us, and how respect for water is integral to the ongoing process of reconciliation that our society needs to undertake. See www.rainway.ca for more about the Rainway. Walkers include: Greta Borick-Cunningham, Sarah Primeau, Amy Kiara Ruth, Shahira Sakiyama, Lacey Williams, Rita Wong. All genders, ages, and cultures are welcome to join us. We will have blue fabric, and encourage you to help us re-create a living, human stream, as we walk and talk. Sarah Primeau is a landscape architect and ecologist who lives and works in the neighbourhood, and who is passionate about using rainwater to help bring life to cities. Amy Kiara Ruth is a kinesiologist and somatic movement educator who is a friend and guardian of the Rainway. Shahira Sakiyama lives by the rainway and is a Creek Steward for the St. George Rainway Project group. She loves to create and support events for water with kids and, ideally, music, food, and fun! Lacey Williams is an urban planner and artist currently living and working out of Vancouver, BC. 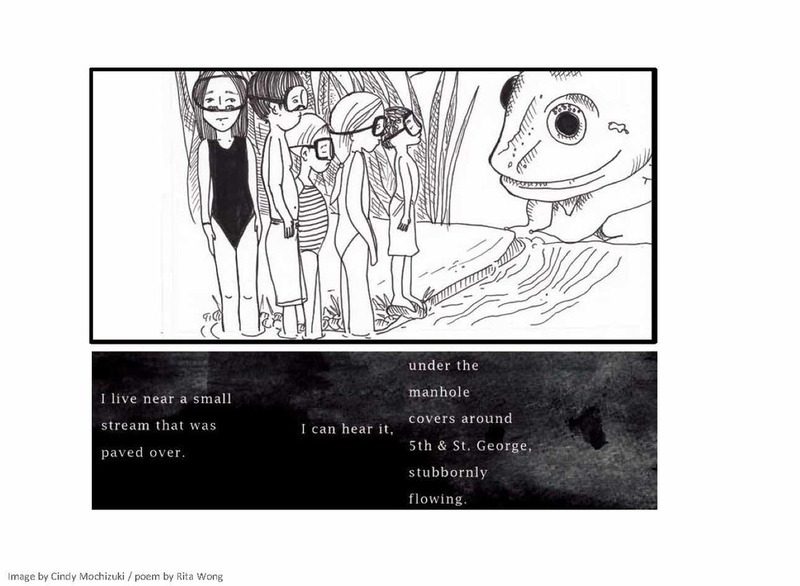 Rita Wong is a writer, educator and water lover who lives along the Rainway and works to reconnect this city's neighbourhoods and citizens with the streams beneath their feet. On November 5th, 2013, The Vancouver Society of Storytelling (VSOS) and The Creek Stewards from Mount Pleasant Elementary School led a day of activities on St George Street, from Kingsway to 13th Avenue, in the headwaters of the te Statlew - the little creek now known as the St. George Rainway. 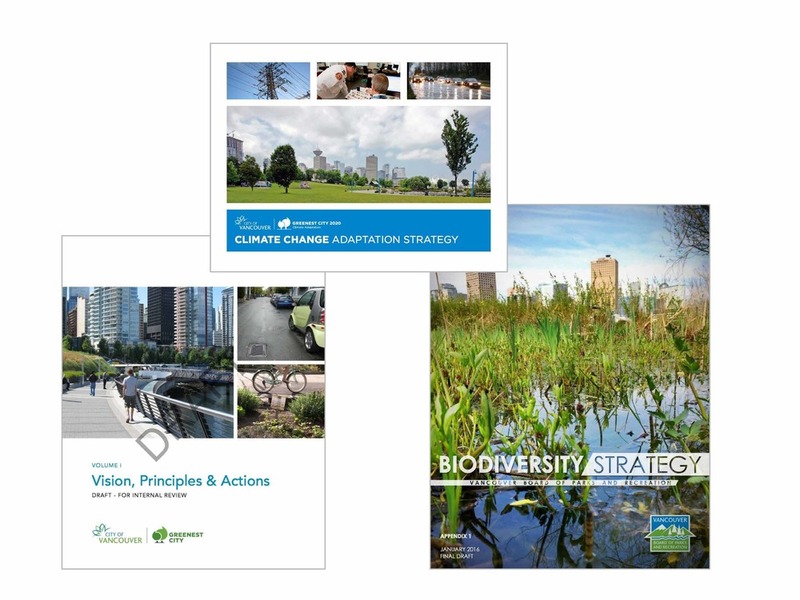 The event reflected and celebrated over a year of work that the students undertook to meet their community enhancement goals, understanding that Green Infrastructure builds social cohesion and is a long-term antidote to isolation. We asked ourselves the question: what role do we as citizens and taxpayers play in influencing the development of the place we call home? The activities were designed to inform and inspire engagement with place-making. Since the car-dealership on the corner is redeveloping, it is urgent and imperative that all community stakeholders engage with telling the story of what the headwaters of te Statlew could be. We are grateful that Destination Auto is open to a community design process and conversation about integrated public space. Together, we can weave our narratives together in a good way. Adoption into Mount Pleasant Community Plan! 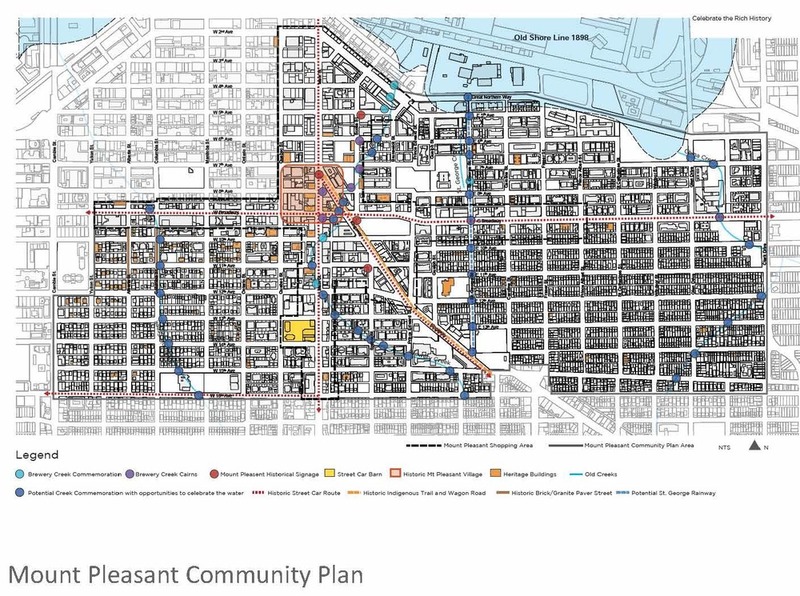 On October 23, 2013 the City of Vancouver council adopted the Mount Pleasant Community Plan Implementation Plan, which includes the St George Rainway as a part of the Public Realm Plan. Together with the Vancouver Society of Storytelling, we built a cob bench to mark the headwaters of te Statlew. Watch the video below for background on its design. Join the Carnival Band and storyteller Naomi Steinberg in a parade tracing the historical creek beneath St. George Street. Water themed costumes are encouraged. Meet in the field of St. George St. and 7th Ave. We’ll end the parade with lunch at Mount Pleasant Elementary. 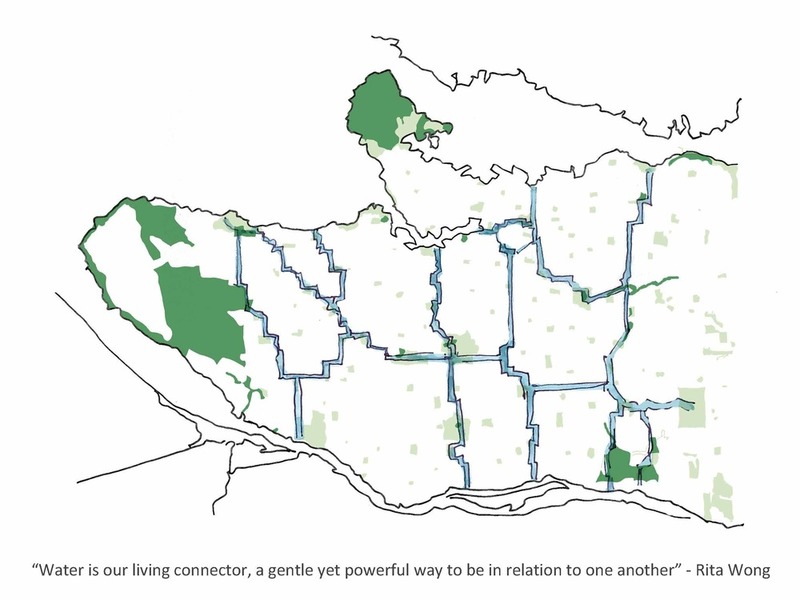 Join Julien Thomas (community member, facilitator), Branca Verde (City of Vancouver – Community Planning), and more local citizens to share ideas for how to green and blue our neighbourhood (Mount Pleasant Elementary lunchroom). All are welcome to these free events. Please forward this to folks who might be interested. As part of the City’s 125 celebrations, the Vancouver Park Board selected a team of digital media artists to work within the Vancouver community to capture the oral histories, stories and memories of local residents. The St George Creek / Rainway group produced the following video for the series (more here). Contact Us + Get Involved!